AWS is focused on innovation and on making life easier for technology people: It’s in their DNA. ZALORA was founded in 2012 and is the largest online fashion retailer in Southeast Asia. ZALORA operates in Brunei, Hong Kong, Indonesia, Malaysia, the Philippines, Singapore and Taiwan. Localised sites ensure that fashion is tailored to the tastes of the different countries and adapted to their preferences, with a good mix of over 500 international and local labels to choose from. ZALORA carries over 200,000 fashion products and are the leading technology-powered fashion player in the region. ZALORA started operations by running its content management systems, applications, websites and payment gateways, and the servers, storage, networks and associated infrastructure to support them, in a hosted data center. However, in 2013, the business launched its own brands. Combined with a loyal, growing customer base and massive growth, ZALORA experienced a surge in demand. The business could not scale its existing hosted infrastructure to support this growth without considerable additional investment. The old infrastructure could not support peak demand without requiring investment in capacity that would remain unutilized for most of the year, while new servers could take weeks to procure and slow the process of adding new features and functions to the company’s products. The business started exploring more cost-effective infrastructure options that could also scale to support its longer-term expansion options. ZALORA’s technology team initially had reservations about migrating its websites, applications, and associated systems to the Amazon Web Services (AWS) cloud. “It looked interesting, but we didn’t know if we could trust its availability,” says Karthik Subramaniam, Chief Technology Officer, ZALORA. By January 2013, ZALORA had seen enough of Foodpanda's, a sister company, success with AWS to experiment with its own small footprint in the cloud. ZALORA’s experience prompted its technology team to steadily expand its AWS cloud deployment. In November 2014, further validation came from ZALORA’s sister company in Australia and New Zealand, The ICONIC, who migrated their customer-facing systems to AWS over a weekend. In mid-2015, ZALORA launched its new Taiwan site directly into the cloud service. By Mar 2016, ZALORA’s servers in the datacentre were completely shut off and all systems were migrated to the AWS Cloud. The business is running its websites using core AWS services such as Amazon Elastic Compute Cloud (Amazon EC2) to provide resizable virtual compute resources. The number of Amazon EC2 instances running in the ZALORA AWS infrastructure has climbed from a baseline of five to 400 today, a number that climbs to 1000 instances or more during peak periods. ZALORA uses Amazon Simple Storage Service (Amazon S3) to store static assets, and Amazon Relational Database Service (Amazon RDS) to deliver a highly scalable primary database for all staging and some production systems. The business implemented a custom snowflake schema on Amazon RDS, linked it to well-known ETL tools, and used it to drive core business reporting across all functions. ZALORA also uses Amazon Redshift as a Data Warehouse for retail reporting, merchandise planning, and monitoring of retail KPIs. The Amazon Redshift Data Warehouse includes clickstream data from tracking tools, and the business has invested in building custom solutions around Amazon Redshift to support better decision making in their retail business unit. ZALORA uses Amazon Route 53 to provide domain name services, and Amazon Simple Email Service (Amazon SES) to send password reset emails on internal systems. Lastly, the business uses Amazon CloudWatch to monitor and manage its AWS infrastructure, while the process of creating and managing AWS resources is largely automated with AWS CloudFormation. ZALORA has achieved a range of benefits from running its entire infrastructure in the AWS cloud. Even managers with no IT expertise have understood the impact that AWS has had on the business. “Non-technical management see the benefits when business goals are met faster, or we can release features more quickly. “The AWS self-help culture aligns beautifully with the way our technology team work. 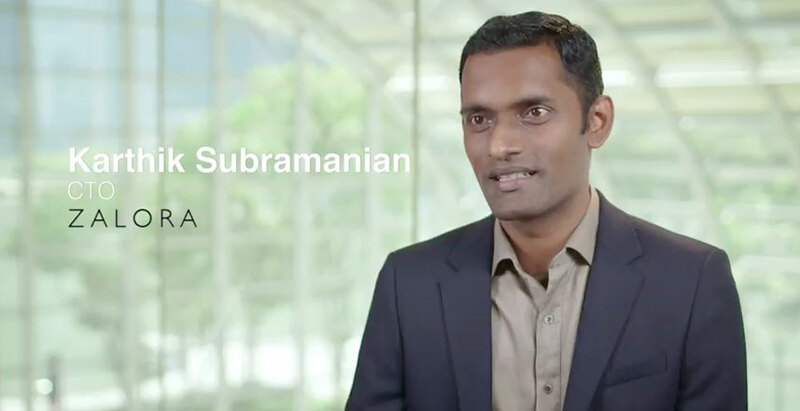 We received help from AWS extremely quickly when it’s needed,” says Karthik. ZALORA managed to minimize its investment in technical personnel and resources with the help of AWS. Of its 1,500 employees, less than 150 are engineers. The ability to provision virtual instances in minutes helps enable the business to regularly add new features to its websites. Karthik estimates the process of bringing new products to market is up to three times faster with AWS, than in its previous hosted data center environment. ZALORA is now well-equipped to scale to sustain growth that has seen it support up to 30 million unique users per month and became one of the region’s most valuable web properties. For those websites running on AWS, ZALORA can easily increase capacity by up to 300 percent to meet demand during sales, and shut down the excess capacity in minutes. Karthik is extremely pleased with the service AWS has provided. “AWS is so easy and that’s the beauty of it. AWS is focused on innovation and making life easier for technology people: it’s in their DNA,” he says. To learn more about how AWS can help your website and website hosting needs, visit our Websites & Website Hosting details page.